For every pokemon you encounter on your adventure to become the world’s greatest trainer, you have about a 1 in 8000 chance of that pokemon being ‘shiny’, or a different color than normal. Put an uncommon event in any video game, and of course a few people will take that feature to the limits of practicality: [dekuNukem] created the Poke-O-Matic, a microcontroller-powered device that breeds and captures shiny pokemon. We’ve seen [dekuNukem]’s setup for automatically catching shiny pokemon before, but the previous version was extremely limited. It only worked with a fishing rod, so unless you want a ton of shiny Magikarp the earlier setup wasn’t extremely useful. This version uses two microcontrollers – an Arduino Micro and a Teensy 3.0 – to greatly expand upon the previous build. Now, instead of just fishing, [dekuNukem]’s project can automatically hatch eggs, search patches of grass for shiny pokemon, and also automatically naming these new shiny pokemon and depositing them in the in-game pokemon storage system. The new and improved version works a lot like the older fishing-only automated pokemon finder; a few wires soldered on to the button contacts control the game. 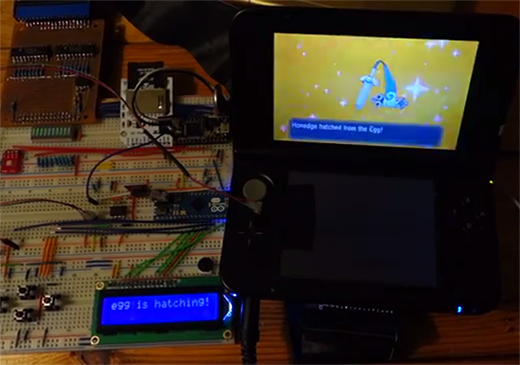 The Teensy 3.0 handles the data logging of all the captured pokemon with an SD card and RTC. What did [dekuNukem] end up with for all his effort? A lot of shiny pokemon. More than enough to build a great team made entirely out of shinies. Video below, with all the code available through a link in the description. Makes more sense than Bitcoin. There was a scripted event for one in gold/silver/crystal/heartgold/soulsilver and I got a shiny geodude on firered. I got the crystal one. End result is that in several years of gameplay (although not utterly addicted like some people) I have only caught 2 shiny pokemon. Some people soft reset their consoles repeatedly at the opening of the game when you select your pokemon just so they can have a shiny from the beginning of the game. Got 1 mate that did that for heartgold and then did some bizarre runthrough of the game where in order to pass each gym he had to catch a new shiny pokemon for it and also four for the league, he spent hour after hour running around in patches of grass to catch shiny pokemon. Did complete it, unlocking daycare for breeding speeds things up (shiny chance can be increased for pokemon hatched from an egg). Nice! But didn’t understand the game. You capture animals and force them to fight each other. Turning the most endangered species into killing machines is a status symbol. It’s for kids and Japanese people. How about a big neon sign that says “You Win” and be done with it? Or just lie and say you did. When all the challenges are removed then what is left? You know what would be a thousand times easier? Just get a Rom flash card and hack your save file to give you any pokemon with any statistics. There’s programs out there that will do all of the work for you. Regardless incredible ingenuity in figuring out how to interface this hack effectively. Well done sir.